On January 26 2005 I pulled from a backyard a Male Guinea Pig and two Rabbits (male and female), survivors of Hurricane Katrina and the last survivors of 11 rabbits and 3 guinea pigs.. 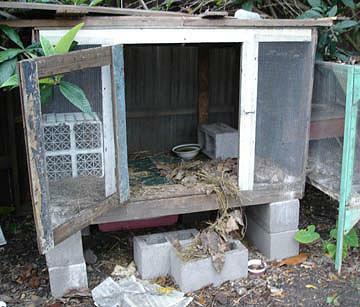 The rabbits were transported north where they would have a chance of adoption. The male Guinea Pig stayed with me. 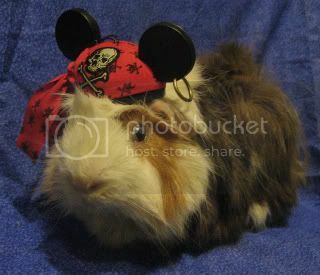 Gumbo, as the guinea pig was renamed, was in good/poor condition. He was a bit underweight, dirty and his nails were overgrown and curling around. He also had a large foot spur. Under loving care he quickly put weight back on and his injuries and issues from neglect were soon healed. Gumbo's physical appearance was starling. He has a general tattered look to him. Upon investigating the story of his life before the storm I found out that Gumbo was housed in an outdoor hutch with at least one rabbit. The hutch he and the rabbit lived in was inadequate. 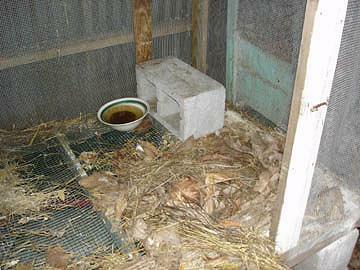 It had a wire floor, no resting boards, no enclosed housing for the animals to get out of the weather or stay warm in and was open to the wind on 3 sides. The only furnishings in the hutch was a cinder block, a plastic milk crate and a bowl of scummy water that once held food. A couple of handfuls of poor quality hay and pine needles along with newspaper were thrown into the hutch as their only means of burrowing for warmth and relief from the wires. Gumbo's feet were red and inflamed but luckily he did not yet have a full blown case of Bumblefoot. On Gumbo's health check with the vet several old and healed injuries were found. 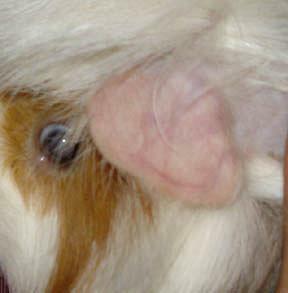 All of the injuries are consistent with damage a rabbit could inflict upon a Guinea Pig if they shared a cage. All over Gumbos body are scars of various sizes including one or two that could have been from ruptured abscesses. I could not get clear pictures of those because of his hair coat. His ear is torn and tattered. He has a great deal of scarring on his left eye. The vet suspects a traumatic injury caused this rather then a simple infection. Once again the vet said it is consistent with an injury that can be inflicted by a rabbit. 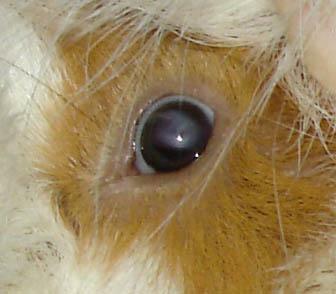 The scarring covers so much of the guinea pig's field of vision that it is suspected he has no real vision in that eye at all. 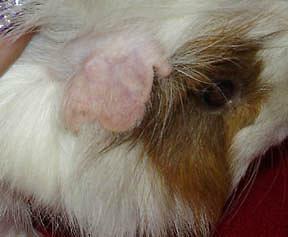 The middle digit of his left hind food has been amputated. The vet concluded that is was a traumatic amputation. The cause could have been getting it caught somehow or bitten off by another animal. Considering the other injuries and scars the vet believes it was probably bitten off, most likely by a rabbit. The owner of the rabbits and guinea pigs told me that Gumbo and his rabbit companion were 'best friends'and that they got along wonderfully. All evidence points to the opposite. These injuries may not even have been caused by fighting between the animals. It could have been, in the rabbits mind, playful tussling. 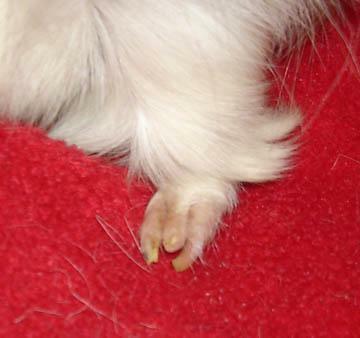 Unfortunately a Guinea Pig is not equipped for such rough handling and the injuries Gumbo suffered are proof of that. Please NEVER house guinea pigs and rabbits together. Last edited by Elly on Mon Feb 27, 2006 10:47 am, edited 1 time in total. Lynx, I placed this here. Move it if you wish. You have my permission to edit also. I am going to try to get a better picture of his eye scarring. That one doesn't do it justice. Oh Gumbo.. you are a brave and smart and lucky ol boy to have found yourself an Elly to take care of you until you get a forever home that is not a crappy one!! Poor little guy. Glad you saved him. Thanks! I take it I have your permission to put the pics on this server? It will make them more reliable in the future. Oh poor little guy. How wonderful that he's now safe with you! Could be me but I can't see the pics - I get a X. Yes Lynx, the pics and text are yours to use as you choose. I'm so glad Gumbo is with you now Elly! I don't understand why people would think to put rabbits and guinea pigs together, but it sure seems to happen a lot. 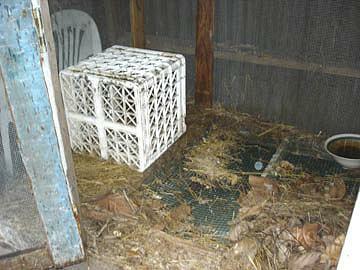 The two pigs I adopted were also housed with a rabbit in an outdoor hutch. Great idea for a thread Elly. Over here pigs are housed with rabbits in the pet shops - it makes my blood boil. Thanks, Elly! I stuck the pics here so there should no longer be X's for anyone. It is with a sad heart that I let you all know that Gumbo is leaving us. He has slowed down dramatically over the last couple of days. He has seen the vet and there is nothing wrong with him other then advanced age. This morning he has shown no interest in his veggies and is lying by the food bowls, near his girls. I do not expect him to make it through the day and will not be taking any extreme measures to prolong his life (or death as the case may be). I will let him gently pass with his women to comfort him. I want to take this time to thank you all for helping to save his live when he was rescued and helping me to get him neutered so that he could live out his remaining years with his harem. He had a great life here. It was a much better one then he ever had before and if he could I know he would thank every last one of you. Wish him well on his journey and pray it is a peaceful one. I am greatful he spent over two happy years with you. I know you will miss him.